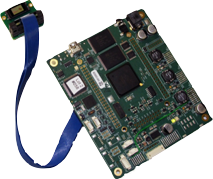 Short working distance using the DLP4500 chipset. 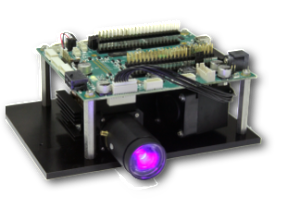 The P5/ST version of the LC4500-RGB short throw optical engine offers a 1.2:1 short throw lens to users needing to create a large image within a short working distance. NOTE! The standard board does not come with connectors to plug in a BeagleBone board. Please order the PEM option if needed. As with our standard LC4500-RGB optical engine, it provides a full color, high resolution (912x1140) and high brightness projector (200 lumens standard with >350 lumens possible in "full-white" mode"). This projector has excellent uniformity and optional short focus capability. It is well suited for industrial applications such as structured lighting, 3D machine vision, medical and life science, mass spectrometery and display applications. 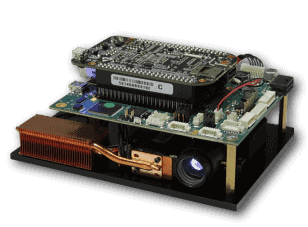 If you need full networking support using Ethernet, or want to build your own embedded application for use in production systems, just plug in a BeagleBone Black or BeagleBone Green and download our toolset. You can learn more about the optional BeagleBone processor daughtercard at http://beagleboard.org/bone. If you prefer a quicker solution, you can use our LC4500-PEM application, which provides programmable pattern sequence sets with a graphical user interface supported on Windows, OS X and Linux. Don't hesitate to contact our engineering team with any questions about LC4500 modifications. Up to 200 lumens (full color), 350 lumens (white only, short duty cycle).